If you read my blog regularly you know that I love subscription boxes. I love them for so many reasons but my main reason is that I love offering my family healthy snacks but don't always have the time to scout stores for new healthy alternatives. Or often when I do I have to finish what I bought since no one liked it. And that happens more often then you'd think! Who knew cinnamon sugared sprouted lentils were just not what my kids want for snack? The other reason why I love subscription boxes is the fact that they show up at your door and surprise you. A box filled with snacks everyone gets to try - who wouldn't love mail like that? The only issue with subscription boxes is that they often come with a big price ticket. Well, not anymore. I stumbled upon the Goodies Company Tasters Box and it only costs $7 a month with free shipping! You get 5-8 snacks to try and if your family does not approve you are not forcing yourself to finish those BBQ flavored chick peas! Win -Win! Plus, you can review the items you get and can earn points towards a FREE Tasters Box. That sounds even better! Get a free box (after earning enough points) for simply reviewing what was in your box. 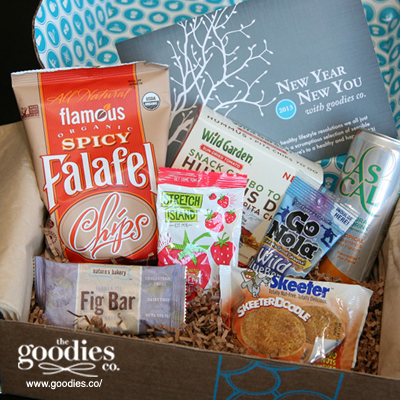 Since Goodies Company's Taster's Box is so popular it is by invitation only and there is a waitlist. just use BLOGVIP when you sign up HERE and get your subscription now! So what are you waiting for? Limited invitations with BLOGVIP! Sign up HERE! Thanks to the Goodies Co. for sponsoring this discussion. I am being compensated for this post but all opinions are my own! Apples, oranges and Angry Bird cheese crackers packed in Easylunchboxes with a Pepperoni and Salad Hulk sandwich. Apples, Oranges and Angry Bird cheese crackers in our new Good lunchbox with two chocolate spread Spider-Man sandwiches. Monbento kindly sent me their Original bento box to review. You can really see and feel the quality of this two-tier bento box. The box itself has nearly a soft feel to it and the plastic is thick and matte - simply beautiful. The MB Original bento box comes in many color combinations but I love the simplicity of this white butterfly box. The top tier comes with a divider and both compartments have a lid that forms an airtight seal and enables both tiers to be microwavable thanks to the silicone caps that make it easy to vent. 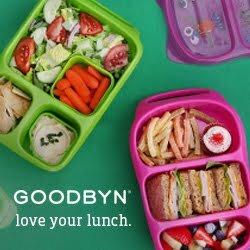 There is ample room in both tiers for either an adult bento, big kid's lunch or when used with only one tier a smaller child's lunch. I packed lunch for myself as a change and was able to fit some left over taco chicken, black beans and corn with cheese butterflies and tortilla chips on the side and in the lower tier a salad with cucumber, radishes and carrots with poppy seed dressing ( you can see the dressing bottle peek out behind the butterfly silicone cup) and a silicone cup full of sprouted lentils seasoned with brown sugar. It held plenty of food for a generous lunch and nothing leaked thanks to the air tight seal! There really were not really any negatives besides the fact that you probably want to buy the box for yourself since it looks just to good to share with your kids ;) Check out the Monbento website for more bento boxes, bags, accessories and cutlery. I fell in love with their whole line! 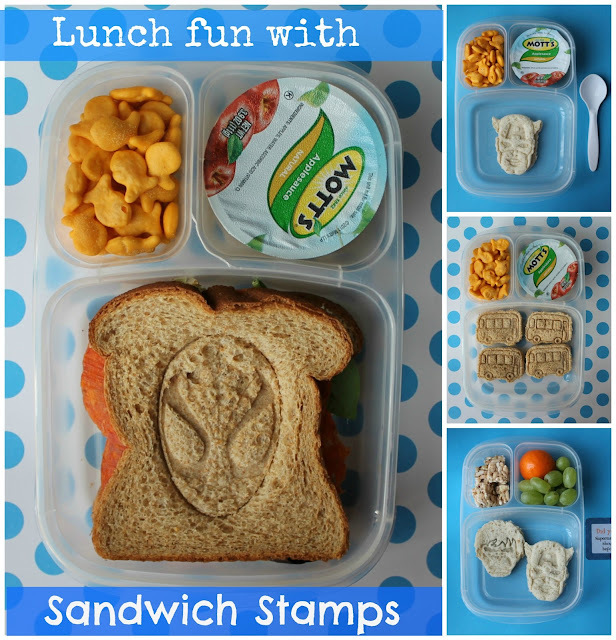 A quick Throw&Go Lunch in our Easylunchboxes: Goldfish, apple sauce and a pepperoni and salad sandwich with Spiderman stamp. They also packed water and yogurt. and as always they have yogurt, ice water and today also the perfect Lunchbox Love Card! Love these sandwiches! Even my youngest son wanted a Captain America sandwich and that means a lot since he really does not like sandwiches in general! I packed him Goldfish crackers, apple sauce and one Captain America peanut butter sandwich. He also has ice water and yogurt. 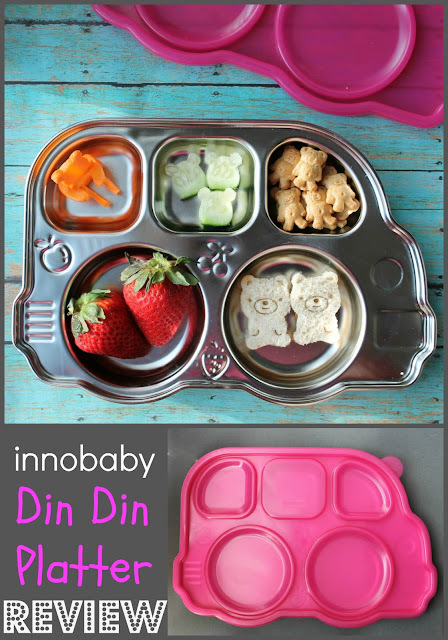 The folks at Innobaby generously provided us with a Din Din Smart Platter for review. I was impressed immediately! The platter is made with durable stainless steel and the lid is made with thick BPA-free plastic. The color of the lid is beautiful and bright and the whole platter just looked and felt durable and fun! My daughter loved this tray immediately. A pink bus shaped platter - just for her? Yes, please!! foods without worry! I also love that the sectional lid keeps the food fresh when I need to prepare lunch or dinner ahead of time and I can keep the platter in the fridge until needed. It is also convenient when we are on the go. It keeps the food in it's place until we are ready to eat - however runny foods like apple sauce or yogurt are only recommended if you can carry the tray flat since the lid does not make the compartments leak proof. The tray is shaped like a bus and has 5 compartments - perfect for introducing the 5 food groups. There are three smaller and two bigger compartments. 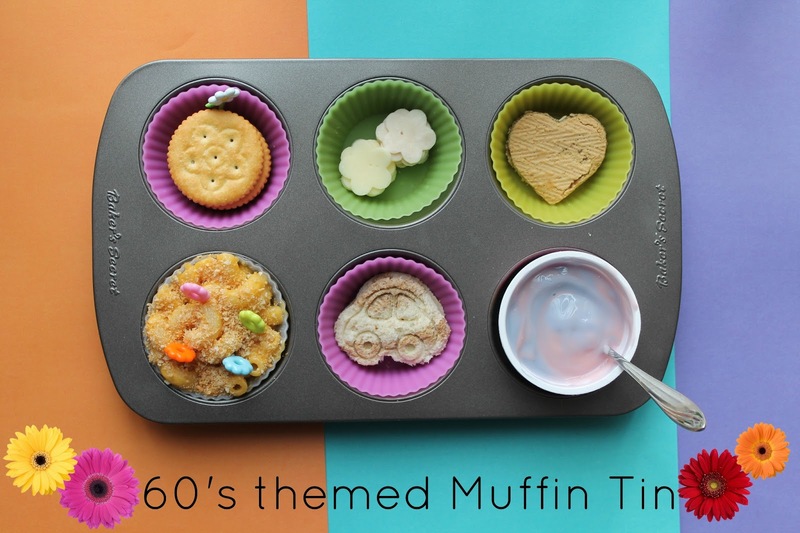 The compartments are slightly more shallow then a muffin tin. Offering different foods to your child is so much fun with this Innobaby Din Din Smart Platter. 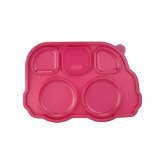 It holds enough food for my 4 year old daughter and I think this tray would be perfect from the first solid foods up until Kindergarten age! For today's snack we packed a carrot bear, bear shaped cucumbers, Teddy Grahams, Straw-bearies and two mini peanut butter bear sandwiches in our Innobaby Din Din Smart Platter. 5 compartments that keep foods seperate - great for picky eaters! stain resistant - bring on the tomato sauce! the platter is not leak proof however I don't really consider this a real negative since you can always bring the applesauce or yogurt in a separate container! I packed her some banana and strawberry yogurt, a radish mouse trying to steal her cheese cubes, a fruit salad with honey and two mini cheese quesadillas. My daughter loved the radish mouse and wondered if she was hungry, too. Maybe they can share the cheese ;) If you'd like to find out how to make this radish mouse check out THIS tutorial! We are again out and about today so an early lunch is packed in our Innobaby Din Din platter with lid. We packed no bake energy bites, strawberries, apples, two jelly sandwiches and some carrots with ranch dip. 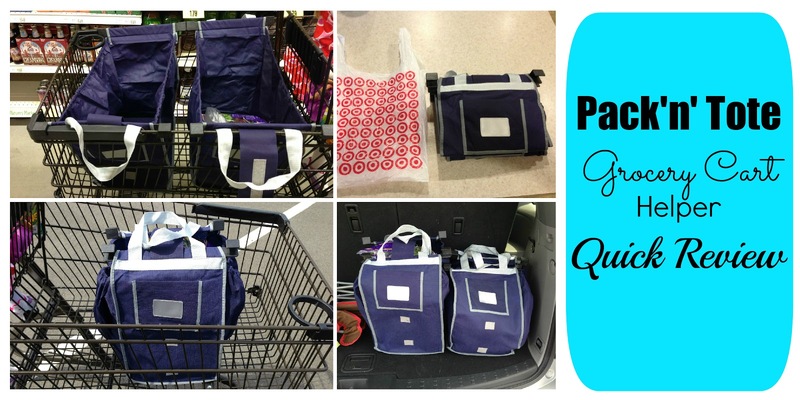 I posted some pictures on Instagram today of my new reusable Pack'n'Tote Grocery Cart Helper and so many of you wanted a link and more information that I decided to write a mini review with link! 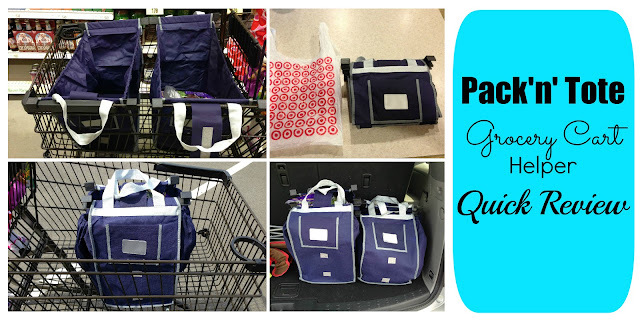 I have been looking for a good reusable grocery bag for a while and found something similar when another Instagram friend, Becka from Just a Bunch of Momsense, suggested these. She was very happy with these and at $8.95 each I felt I could not really do anything wrong. First off: I LOVE the size. 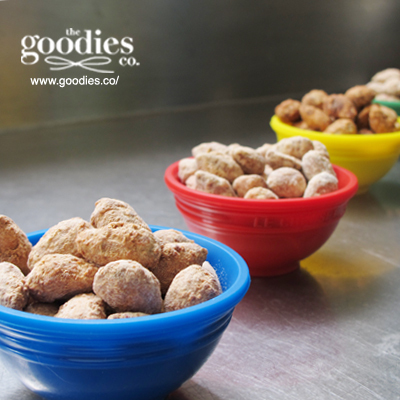 When folded they take up less room in your car or cabinet then a regular grocery bag and they are easy to grab & go! ...two, they clip onto your shopping cart and stay in place while you shop! And when you are done, you can close them up and walk to your car or load them into your trunk comfortably. *side note: bread, fruit and eggs should be handled with care in these bags since they can get smooshed when the bag is grabbed out of the cart. Two of them in my trunk!